4 Paws Cat Repellent Spray will keep your cat away from the places that you don't want them to scratch and force them to use the scratching board. It is scientifically formulated to deter your cat from scratching the areas where it is sprayed, but humans will not notice the scent. 4 Paws Cat Repellent Spray is also safe to spray outside, so you can guard your trees, shrubs, plants or anything else the cat is tempted to claw or climb. It's also great for protecting trash cans from neighborhood cats. The spray is effective for up to 24 hours, so you'll only have to spray once a day. 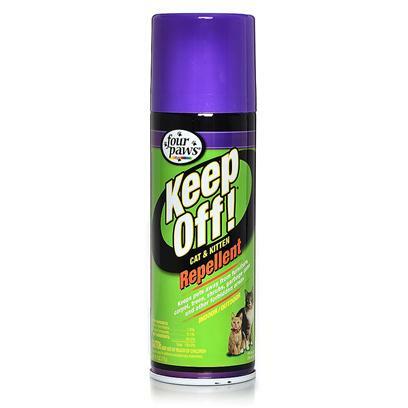 The 4 Paws Cat Repellent Spray can is easy to use; applying it to the areas you want to protect is, literally, a breeze.